1 of 2 In a large nonstick skillet, heat olive oil over medium-high heat. Add sliced mushrooms and cook 3 minutes. Stir in ground beef, basil, salt and black pepper. Cook 5 minutes, stirring occasionally. 2 of 2 Add marinara sauce and cook, stirring occasionally, for 5 minutes over medium heat. Stir in heavy cream and peas. Heat through. 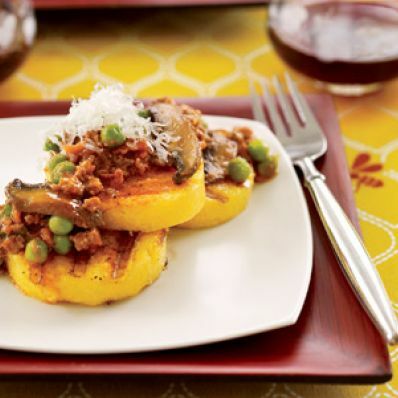 While sauce is cooking, cut polenta into 1/2-inch slices. Heat a grill pan and grill polenta until heated through. Spoon sauce over polenta slices and sprinkle each serving with Parmesan cheese.